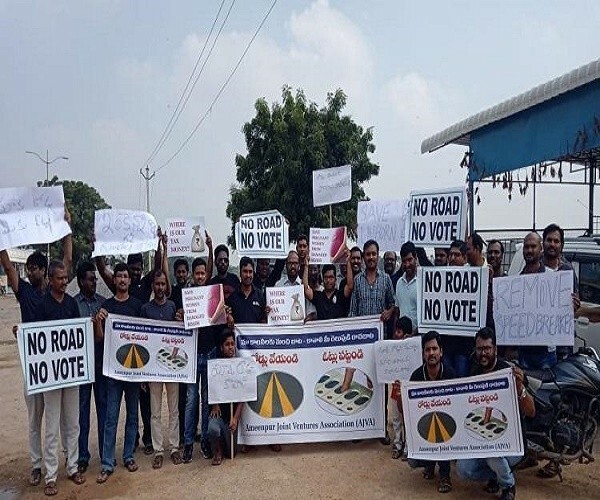 Angered over months of government apathy and the state’s failure to provide basic amenities, the residents of Ameenpur in Hyderabad staged a protest earlier this week, threatening to withhold their vote in the upcoming Telangana elections if the roads were not fixed. The ‘No road, no vote’ (#NoRoad-NoVote)protest was led by the Ameenpur Joint Ventures Association, which consists of 26 residential projects across three colonies. Locals have complained that a two-kilometre stretch of road from Chandanagar to Ameenpur village has been poorly maintained for months, resulting in an extremely bumpy ride for vehicles as well as several accidents. Locals complain that despite repeated requests to officials, no action has been taken. “Since last year, we have reached out to officials like the Collector, Mandal Revenue Officer (MRO), the Revenue Divisional Officer (RDO), the local MLA and the Sarpanch. All of us together have been going repeatedly and asking them to visit our area and provide us with basic amenities but to no avail,” Venkat said. The residents said that they have three demands: well-paved roads, streetlights to improve safety and visibility, and a better drainage system. “The status of roads has been this way for a while now. The officials have been giving us assurances but we are not seeing anything on the ground. At least repair it. 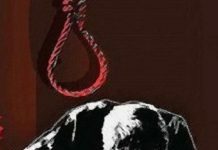 It will cost considerably less, ” said Kamal Nandan, the association’s joint secretary. “When it rains, roads get worse and get very skiddy. There is no drainage system in and around Ameenpur and so it overflows frequently and [comes] on to the roads. This in turn causes a pungent smell and lots of diseases,” he added. 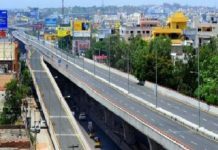 There is also an issue with the area’s jurisdiction as it does not come under the Greater Hyderabad Municipal Corporation (GHMC). Until a few months ago, it was included under the Ameenpur Gram Panchayat, but it has since been upgraded to the Ameenpur Municipality. Locals lament that authorities cite a lack of funds as the reason for their inability to lay the roads. ALSO READ: How 'Politicians' Pay For 'Social Media' Clout For 'Buying Fame'? “Around 7,000 houses have been occupied in the new ventures. How can they say this? Where is all our tax money going?” Venkat questioned. 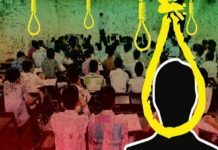 Kamal added that the issue is further complicated by the dissolution of the state Assembly last month by Telangana Chief Minister K Chandrasekhar Rao to pave way for early elections. He has to take rest for one year. He was the breadwinner of the family. Who is going to support them? People are very frustrated,” Venkat said. Locals also believe that at least two women have suffered miscarriages because of the rough ride. “Can you imagine people losing pregnancies just because of the roads they travelled on? It’s horrible. We can’t imagine what the families went through. Who is going to be held responsible here?” Venkat asked. “This is why we went for the protest. It is a desperate plea to help us [get] these things done. It is a request. All we’re saying is not a political issue, It is a group of citizens demanding basic facilities from their elected government,” he concluded. 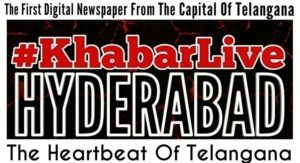 Why The ‘Footpaths’ On Roads Go Out Of Reach In Hyderabad?